When you think of a castle, something like the Cinderella’s palace in Disneyland probably comes to mind, but even though castles in Japan look more like fortresses, they possess a fierce beauty in keeping with this land of Samurai and Shogun. Some of the most famous castles in this island nation are not found in large tourist areas. You won’t find a castle in Tokyo or Kyoto or Hiroshima, but many people who are in Japan for business or as English teachers may find themselves in a castle town. One of these towns is Okayama, located about halfway between Hiroshima and Osaka on the main island of Honshu. Since the castle and garden are major attractions, they are easy to get to from the main train station. Parking is very expensive and there is nothing near the castle, so it’s recommended that you take a Hankinson (bullet train) or local train to Okayama station. If you are not familiar with traveling in Japan, follow the signs to the tourist information booth in the station. There you will find someone who speaks at least broken English. Make sure you get a map in English and ask them to point out the trolley station. See the end of this article for specific instructions on how to take a trolley car to the castle. 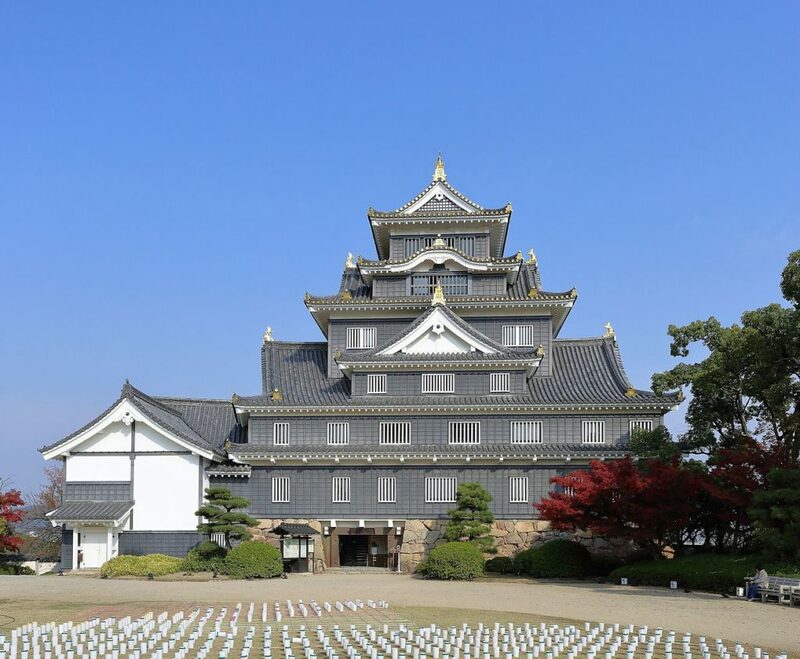 Okayama Jo (“jo” means “castle”) is one of only two black castles in Japan. The rest of them are white. In fact, one of the most famous castles in Japan is in Himeji, about 40 minutes east of Okayama by local train. Himeji Jo (White Egret Castle) belonged to Ikeda Terumasa, who was a rival of Ukita Hideie, feudal lord of Okayama. For Japanese history buffs, Ukita was an adopted son of Japan’s first Shogun,Tototomi Hideyoshi, who united the whole country under a single authority in the 1600s. When Ukita built his own castle in 1597, he painted it black and called it Crow Castle (U-Jo) as a joke. 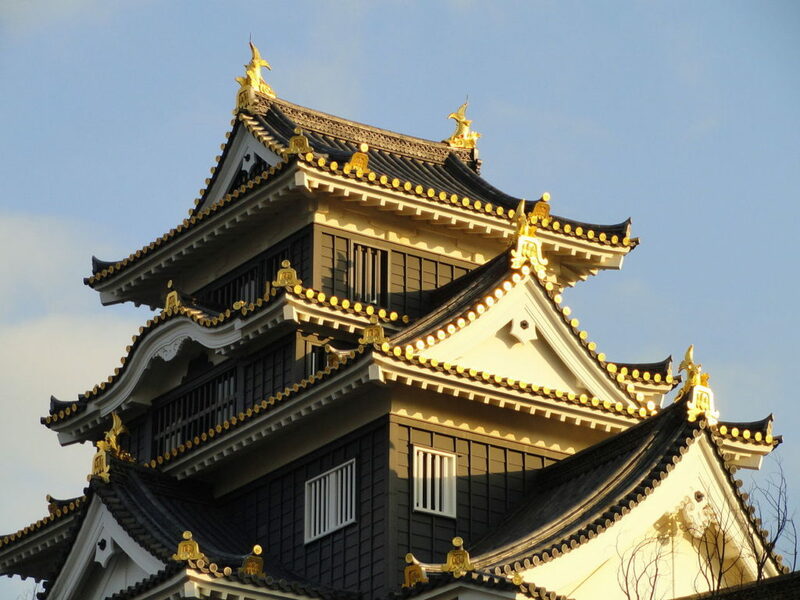 The castle has also been called Kin-u-jo (Gold Crow Castle) because its top roof tiles were gilded in real gold. Today there are some golden fish topping the turrets which are really spectacular to see. At night, the castle is lit with spotlights and since it stands on a hill overlooking the Asahi River, it is a breathtaking sight from trains speeding over the water. 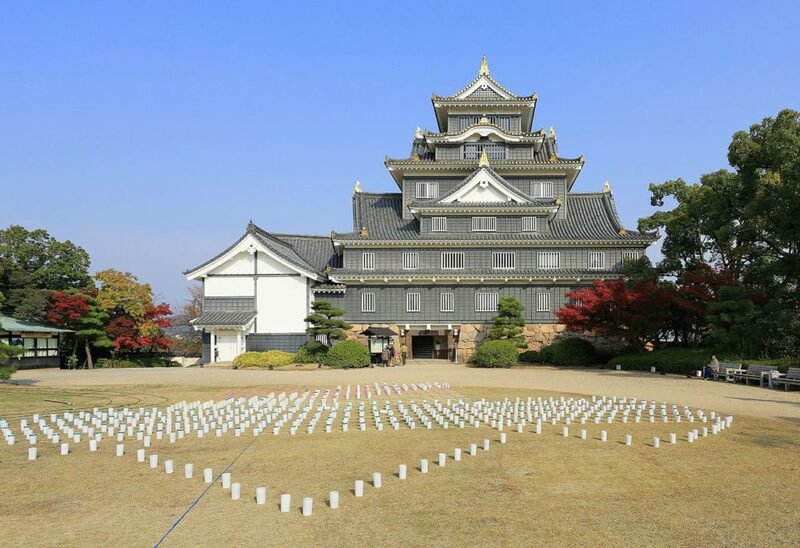 While Himeji castle still stands, the original Okayama Jo, which had been recognized as a national treasure in the 1930s, was destroyed by U.S. bombs in WWII. In 1966 it was rebuilt using reinforced concrete and is an almost perfect replica of the original (something the Japanese seem very proud of). The only building which completely escaped the air raid and subsequent fire was the Tsukimi Yagura (Turret for Moon-Viewing). This kind of turret is extremely rare anywhere in Japan. In addition to moon viewing, the turret was used to protect the castle from raids so it has peepholes ringing the bases of the walls. These are also quite unusual among Japanese castles. Another remarkable feature of this fortress is the natural stone walls made with round stones, one layer on top of the other (called “nozura-zumi). The corners are filled with smaller pebbles. This technique was created when the castle was rebuilt, but if you continue through the large main entrance gate, you can see some original foundation stones that were brought to a garden inside the castle walls during the 1966 reconstruction. The huge stones are often used for cigarette or drink breaks by castle tourists. For a nominal fee (about $3 for adults and half price for school children) you can go inside and see the museum. Although everything is written in Japanese, there is still a lot for non-native speakers to do inside. Be sure to ask for a brochure in English and begin your tour by taking an elevator to the topmost floor. From there you can look out at the city of Okayama from one side and that famous garden on the other side. Make your way down the stairs, one floor at a time, and you can see examples of real Samurai armor and pictures of the castle reconstruction. There are also some unusual free photo ops on the third floor. Look for a black palanquin replicated after those used to carry wealthy Japanese women around town. You are permitted to get inside and pose for a photo, which you may not know if you can’t read Japanese. Around the corner you will see a counter and next to it a tatami room replicating a wealthy Samurai home. Here, you can have a makeover. A castle volunteer will help you put on a heavy, formal kimono robe (over your clothing) and wig. Both men and women can participate. It takes about 10 minutes to be dressed and afterwards she will take your picture with your own camera. The museum does not have equipment to take the photo for you, but they also don’t charge you anything for the photo on your own camera. Two or more people can get made over and pose together. They also have clothing for children. As you leave the museum, take a look at the second floor, which includes a re-created castle town from 450 years ago. They also have traditional Japanese toys that you can play with. When you’re ready to leave, go past the entrance counter and out the exit to your left. It is highly recommended that you use the bathrooms inside the castle museum since they are in much better condition than anything you will find until you get back to the train station. As you walk down from the castle, you can take a close-up look at the gun turrets. Before you return to the train station, be sure and cross the bridge over the Asahi River to visit Korakuen Garden since there are few park-sized, Shogun gardens in this part of Japan. Exit Okayama Station through the Central/Main exit and you will be in the heart of downtown Okayama. There will be a six-lane street running perpendicular into the station. You will need to go to the left hand side of this street, across from MacDonald’s. In the median you can find what looks like a bus stop. It is the trolley stop. Cross over with the light to the trolley platform and look for trolleys going to Higashiyama. Get off at the third stop, Shiroshita Station. When you get out from the street car keep going in the same direction. The castle is about a 10 minute walk.